As I was reassembling my door panels today after doing the window felt fix, I wanted to tackle another project. The fir trees in my door trim 'pillar' piece that runs up the rear of the drivers side door from the door panel to the head liner had worn out fir trees. 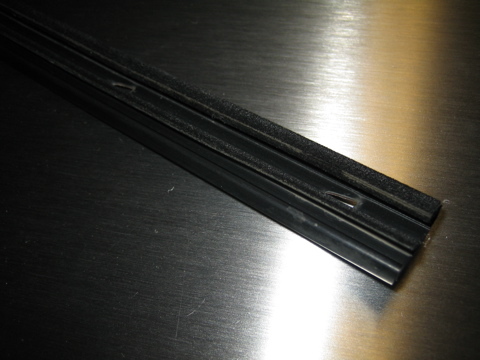 Whenever the upper door panel is off, this trim piece falls right out, and is basically only held in from the upper headliner pressure and upper door panel pushing it in place. Turns out these fir trees are not removable through the plastic, but instead in order to get to them you have to pull up on the vinyl. The fir trees in here are nothing special, the standard 'Ford' size fir trees used elsewhere on the DeLorean can be used here. Just take a dremel to them and cut off the upper connector, so all you have is a fir tree and the flat head so it looks like a T. Pull back the vinyl, remove the old fir tree, and insert the new one. I then hit up the seam with some 3M Super Spray Adhesive and clothespinned it for several hours to dry. It is now back in place with the vinyl secured, and looks good as new. No need to worry about this piece being loose anymore. Been busy lately and haven't had much time to work on the car. Have a feeling that a lot will be getting done in the next few months, though. First up, something that has been on hold for a while. I have been waiting on replacing my window felt with the Ford Probe crossover part as detailed in the tech article on DMC News. 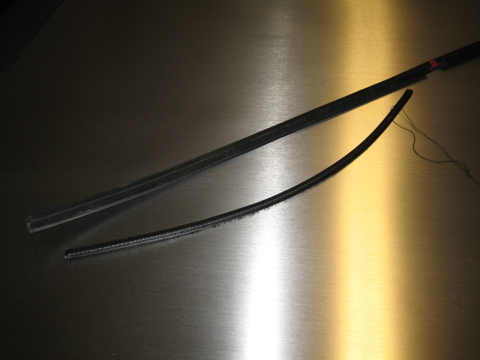 According to the writeup, the crossover part is a 'Window Belt' (Ford language) from a '89-92 Ford Probe. Problem is, Ford stopped making these parts quite a long time ago. So, I called up local junk yards. No luck. Decided then to hop online and find a Probe forum with members parting out their car. Ended up at the Performance Probe boards and found a member with the piece I needed. All in all it ended up costing me $25 shipped for the two sides. Not too bad. Now I decided to go this route for one key reason. The existing felt was falling apart and I tried the 'normal' method of using the soft side of velcro. Problem is in Florida 95 degree heat with 90 percent humidity, the glue doesn't hold. So, I tried again with stronger glue. Still didn't hold. Got tired of redoing it and just thought I would go with a part that wouldn't need glue. 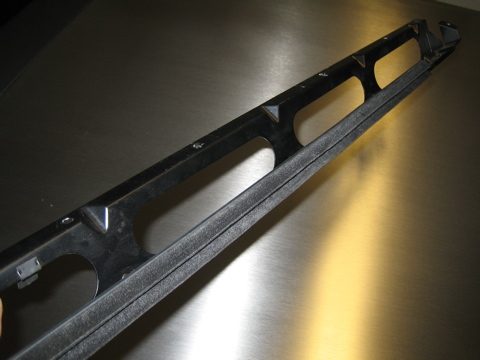 These Probe pieces as seen in the photo above are much beefier than the OEM part. And, rather than felt glued to the rubber, this short pile felt seems to be merged with the rubber as one piece. No glue to fall apart now. 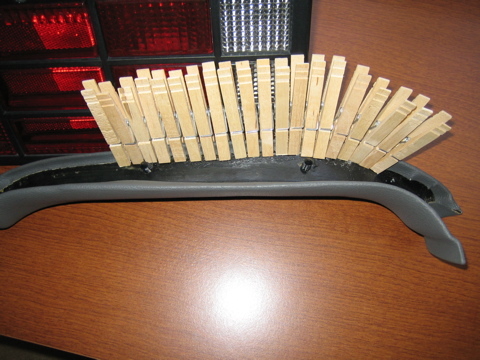 The reason this part was chosen by the person that originally wrote the DMC News article is due to its top lip and double wiper which help it sit correctly on the DeLorean black brace which the original part was attached, and the second lip allows you to place a screw through the hole and it guards the window from being scratched. The felt first needs to be cut to fit. I cut mine a tad bit shorter than the OEM part, as since it is thicker it cannot squeeze as easily into the window opening once the frame is bolted to the door. After cutting, bend up on the stock parts tabs and using a dremel cut them off so you just have the openings as seen below. Now you need some small machine screws, 14 to be exact, in 6/32" by 3/8" size. You also need the corresponding nuts, and 1/2" washers. 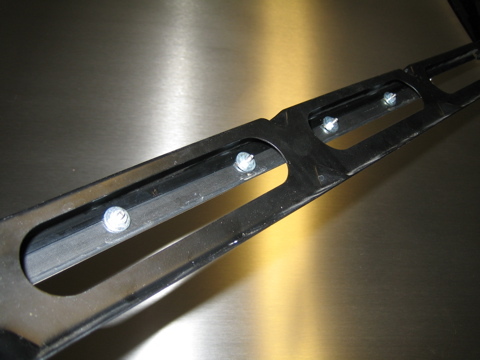 Place the screw in the lip and attach the washer and nut to the back side. What you want to do is get the felt and the washer to pinch together on the existing bracket, and allow the L top lip to hold it all in place. When it is all done just screw it back into the door and test out your window. I am very happy with the results, it even looks better (the little bit that you can see if you peer in). Here is a picture from the top looking down at the window with the inner door panel off. 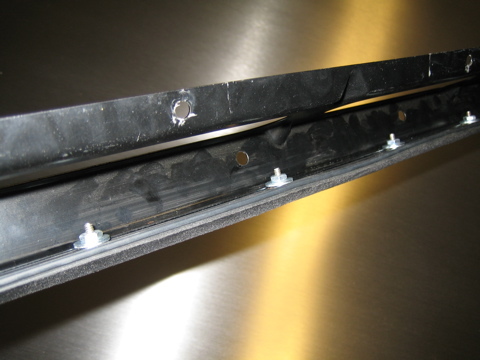 The pressure it holds against the window does not affect the speed at which it rolls up or down compared to the stock part. 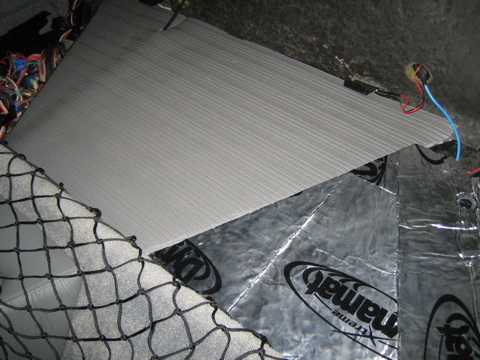 I have wanted to replace the old foam under the parcel shelf carpet for some time now. 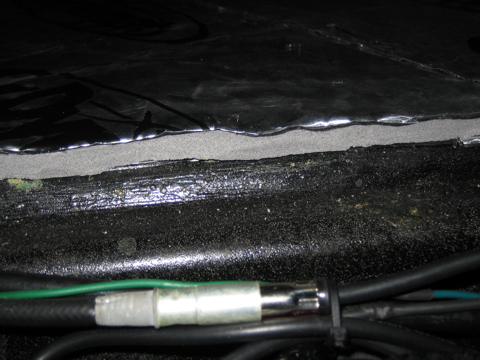 The middle section that goes over the fiberglass has cracked and been flaking off the rubber top, and the foam has a bad odor to it. When the car sits closed for a while it definitely is noticeable. Today I took out the back wall and removed the electrical access panels behind the driver and passenger seat. I scraped off the old foam which came out in small chunks as it tore easily. Once out I cleaned the area and applied Dynamat Xtreme to the center section. 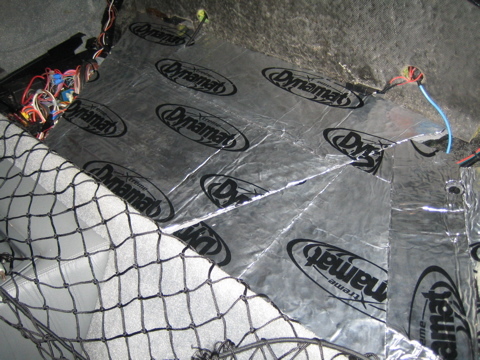 Since the original foam is about 3/8" thick and the Dynamat is about 1/16" or a bit more thick there was a gap between the electrical access panels when in compared to the center section. I picked up some rubber carpet runner at Lowes for about $4 a foot. 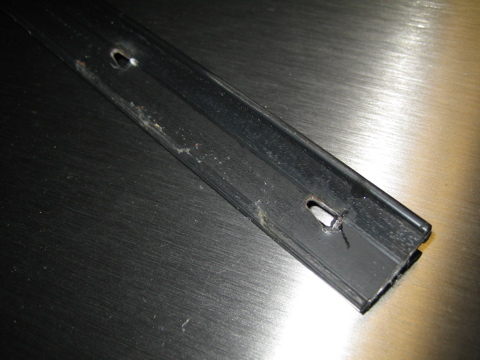 Cut this to fit and used rubber weatherstripping glue to seal it to the Dynamat. 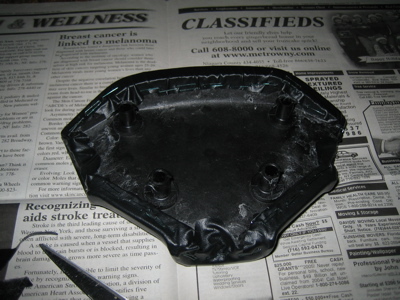 I then put another layer of Dynamat over the rubber (after letting the glue sit for about 6 hours). I also decided to Dynamat the access panels as well as the rear wall. Haven't had a chance to reassemble everything yet and take it out as I want to make sure that any odor from the glue or rubber dissipates before closing everything in. Just of note, I didn't fully follow the instructions to the letter that came along with Leatherique. It says to leave the car in the sun for several hours to get the interior nice and hot, or use a blowdryer. My goal was to leave it in the garage as in the Florida sun the garage usually gets up to 120 or 130 I'd say when its 90+ out. Plus my engine is torn apart. Of course today (put the oil on last night) it was much cooler and cloudy so the garage probably only hit 100. 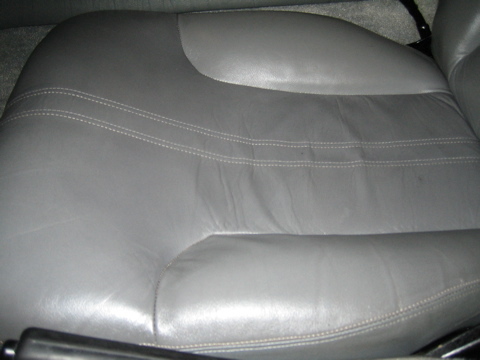 Even though I didn't do it as good as I want to (I will be redoing it) and used 1/2 of the amount of oil they tell you to use, take a look at these before and after pics...the leather was stiff and dry, now it is soft and very flexible. 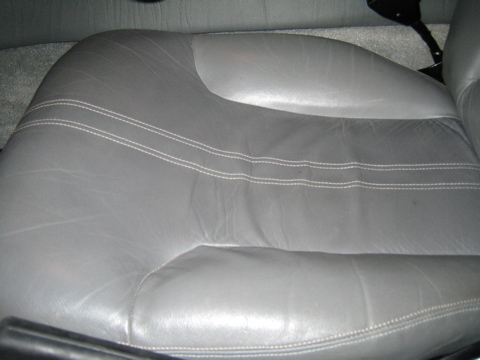 Before I sat in the seat and it just compressed with very little leather flex, now I sit down and it wrinkles around me. Only did the drivers side to test it out, will do the whole car and park it outside once its back together. Well, the car has made its return from storage back home yesterday. Got a LOT accomplished. In regards to the stereo system, with the help of a friend we first started by cutting and splicing in the new radio harness to the old car wiring, and removing all the old speaker wire. 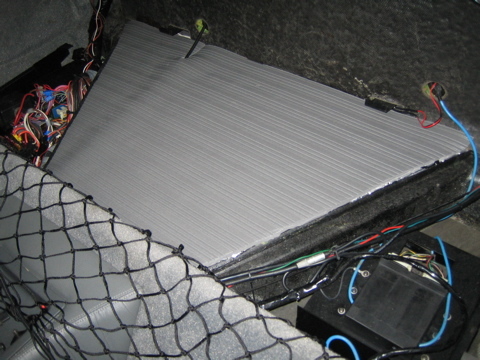 We ran new wire to the front speakers and through the center console area to the back shelf for the rear speakers. We then began to mount the panel bracket that I had cut with the stereo and vents preinstalled. Slowly and carefully we reconnected each switch, ground, and light to where it should go in the bracket. We lined up the A/C vents and screw holes, and connected the radio to the rear mounting bracket. Everything went good, but took some time. Tested the stereo out and it had power. Thought we were good to go. Went to install the rear speakers. Removed the weather stripping and sliced through the rear panel. Removed the seatbelt and screw. Were able to pry the panels out enough to loosen the clamp and take out the old speakers. Fished through the new wire and had the new speakers hooked up in no time. Tested the stereo speakers and everything worked well. Reglued the panels and reattached the weatherstripping. Looks good and stock. Went to start messing with the stereo and realized it would not save the memory of what it was doing last. After some fishing we found out that the constant and switched wires were hooked up backwards. A quick fix and everything was set. Reassembled the center console and went to put the A/C panel back on when the new sticker started to peel apart. Ugh. No big deal, contacted DMCH and hope to get a replacement soon. Once its in, everything will be back together. 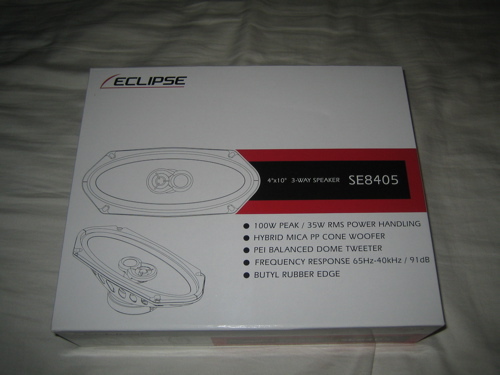 I went ahead and also ordered replacement speakers for the rear panels of the DeLorean. 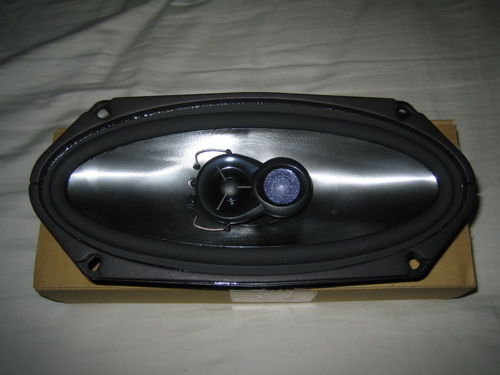 When I received the car only one speaker, the front passenger side, had worked. The rest, nothing. 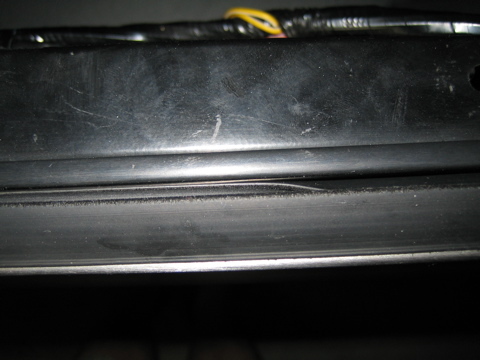 When I went and replaced the front speakers, for some reason the front drivers side still had no sound until I spliced the sound off the working passenger side speaker. Odd. So right now all my speaker wiring is screwed up. Since I have the console apart I want to run the new wiring to all speakers and connect it right to the head unit to bypass all of the 1980's wires. I also want to reroute them as right now the wires are run simply draped under the carpeting behind the drivers and passenger seat. Today I also finished piecing back together the kneepads and steering wheel cover that I removed when cleaning/adding LEDs to the binnacle of the DeLorean. I had stripped a bolt and fixed it which is why it was not finished with the original work. 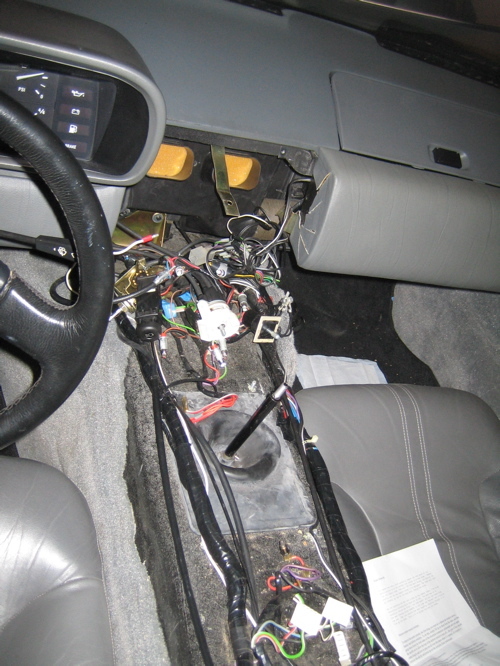 But, the big task accomplished was the removal of the center console and A/C dash bracket. I wanted to take this out to cut out a DIN socket for the new radio rather than cut it while still in the car. 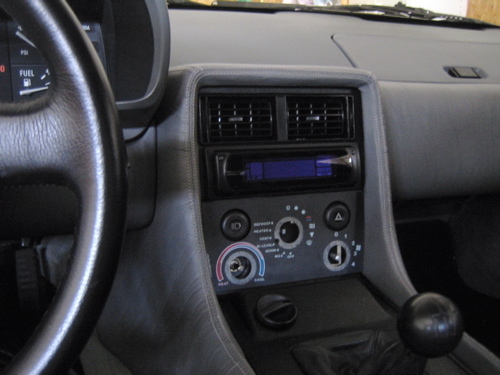 While doing this I decided to pop out the ash tray of the center console to look at for possibly modifying into a iPod dock, and remove the rheostat to replace with a radio remote control. 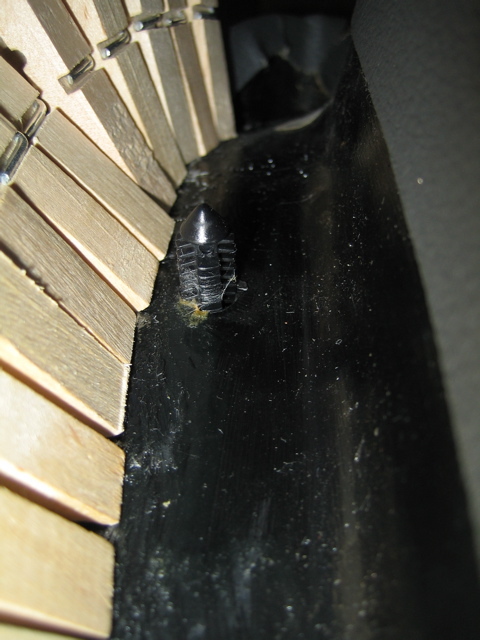 In addition, I am going to clean up the A/C vents as I think they had a bit of dead mold on them. As the car is away and in storage, I can't wait until the weather warms up and I can put the DeLorean back on the road again. Thanks to DeCobra for describing how to go about doing this in this thread. Take the vinyl and peel off the fabric. This is going to leave a bit of fuzz. Try to remove as much as you can. 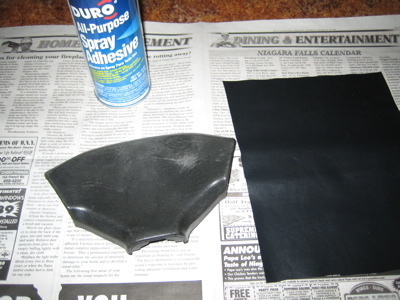 Spray a coat of glue on the entire front surface of the pad. Let it sit for a minute, then place the vinyl over it. Stretch it as much as you can onto and around the rim of the pad. I cannot stress how much this stuff can be stretched, so keep pulling it until the entire front has the OEM look. 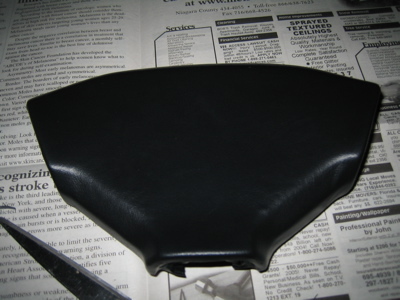 I then flipped it over and sprayed lightly around the back rim, waited, and then finished stretching the vinyl around. I then took another tip from the thread listed above from Patrick C, and used a stapler to finish securing the vinyl in place. Trimmed it with scissors and let it sit overnight. Ever since I have picked up the car, the sticker on the A/C panel was crooked. I had tried previously to heat it up and shift it to no avail. Today I ran it under hot water and then peeled it back and reseated it. Looks good now!